On the 11th of March, just one day after the WeHoRR was held, the Head of the River Race was held. It was held over a distance of 6.8km from Mortlake to Putney. 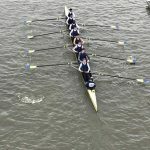 It was the first race on the river Thames for our novice men’s eight which was coxed by Charlotte Trundley. 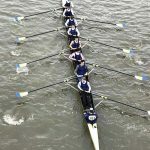 Upon arrival at Putney Town Rowing Club, the men started rigging their boat and got into the race mentality surrounded by other crews. They stayed in their zone and Lukas Schroth, Ben Radcliffe-Brown, Ludovico Iannizzotto Venezze, Roberto de Isidro, Chris Homes, Wilson Sandengu, Abdel Abdalla and Wei Shen Chin had a strong warm-up down the course to their marshalling position. Once the race started, they settled into a strong rhythm straightaway. Even being overtaken by a crew, they remained calm and kept their form. Alongside the bank and on the bridges they were supported by the rest of the squad and friends and family. The shouts going through Hammersmith Bridge really gave them another burst of motivation and they pushed through strongly till the finish line. 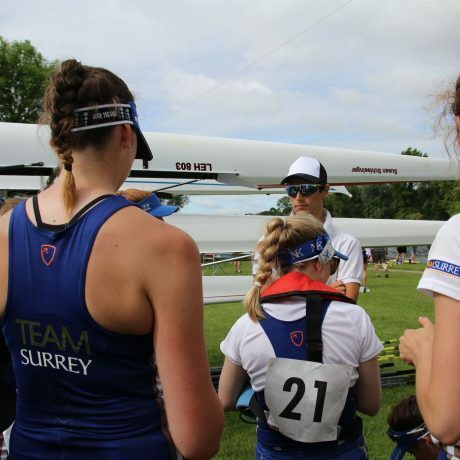 They built up on their performance from BUCS Head and ended up placing fourth in the academic beginner category, the best result ever for a Surrey crew in that category. Overall, they placed 197th out of 300 crews and completed the course in 20:38 min. Paddling back after the race.